I am in Bavaria. It is quite nice here. We have about three inches of snow on the ground. Of course, the food and beer is great. One of the things that I enjoy when I travel is the weirdness that is exposed about my own native language. I am traveling between about 10 or so different languages. I wish I could learn them all. The best I can hope for is to learn one or two to an intermediate or beginner level and grow my vocabulary a few words at every opportunity. 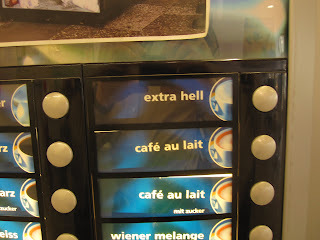 Here is a selection on a coffee machine in Germany. I see similar things in every country. Truth is stranger than fiction. I had a quiet weekend in Duluth. Actually, too quiet. The ice is almost gone from the roads around here. It was quite a spectacle for me. One of the images that I remember vividly is that 4 days after the snow storm they showed a snow plow on the news ripping the ice off the interstate. The plow was going about 15 miles an hour. Can you imagine if the plows only went 15 miles an hour up North? That is where all that Northern aggression comes from, well kind of. I rented the DVD "Encounters At the End of the World" Directed by Werner Herzog. It was filmed when I was on the ice. I was disappointed. The story or message might have appealed to someone, but certainly not me. Most of it was downright boring and I knew and spent time with almost everyone who was interviewed. I guess the thing that bothered me the most was that this is a big name director, Werner Herzog, of "Grizzly Man" and "Rescue Dawn" fame. The camera work was even terrible, amateurism at best for a lot of the sequences. Anne Agnion's "Ice People" footage was certainly much better than his and was used on the recent PBS NOVA program. I am off to Germany tomorrow. I will be spending the weekend in Venice Italy before my meetings in Northern Italy. I decided to take an overnight train between Munich and Venice. I have never taken an overnight train in Europe before so it seemed like an obvious decision coupled with the cost effectiveness. 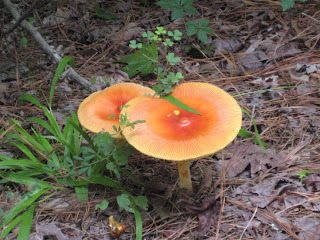 Here is pic from some mushrooms off the farm in July 2008.